Do you remember the freedom you felt once you were old enough to get a two-wheeled bike and allowed to zoom around your neighborhood? 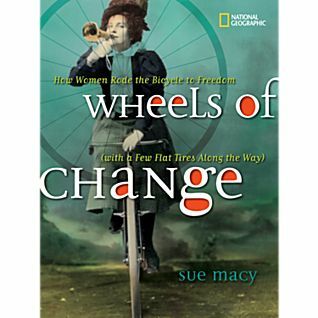 Wheels of Change: How Women Rode the Bicycle to Freedom (With a Few Flat tires Along the Way) by Sue Macy recalls when women first got their own set of wheels and set off unescorted into the world. And that whole unescorted thing really ticked off conservatives at the time. As Macy notes in chapter 2, The Devil's Advance Agent, in the late 1800s women and men dated while being chaperoned by adults, sually in the home of the young woman. With the advent of the bicycle and society's approval for women to jump on board with this new fad, the reach of chaperones was cut. Thus begins the spiral to fogged up car windows on a Friday night. One has to remember that this was at the same time most physical activity, especially sporting activities, was seen as bad for women's bodies and especially their reproductive systems. One also must remember that in the late 1800s women were wearing HUGE dresses. How is a lady supposed to ride a bicycle? Macy shows photos of bicycles that were designed for side-saddle as well as with contraptions so that dresses wouldn't get caught in the wheels or gears. Then the young women of the late 1800s rediscovered Amelia Bloomers invention - Lady Pants! - or bloomers. This is a fun trip through the joint history of the bicycle and women's rights. 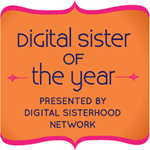 From wheels to bloomers to votes for women, it's all interconnected. You'll be amazed at how similar the conversations we are having today about women's rights sound a lot like the ones in the late 1800s about women riding bicycles. This a National Geographic book for kids. But don't let that stop those without kids from not buying this book from IndieBound or Powells. Disclaimers: A publicist offered me a copy for review for women's history month. Obviously, I'm late writing this baby up. 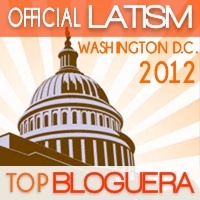 * Book links are affiliate links. If you buy your book here I could make a very small amount of money that goes towards this blog. How in the hell did women ride side saddle? I've been googling up a storm, and still haven't figured it out. Guess I will have to read this book! 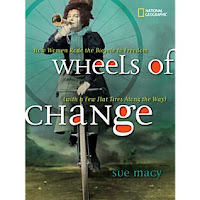 I can't imagine it either, but another review of the book offers a photo of a woman on a bike side saddle.